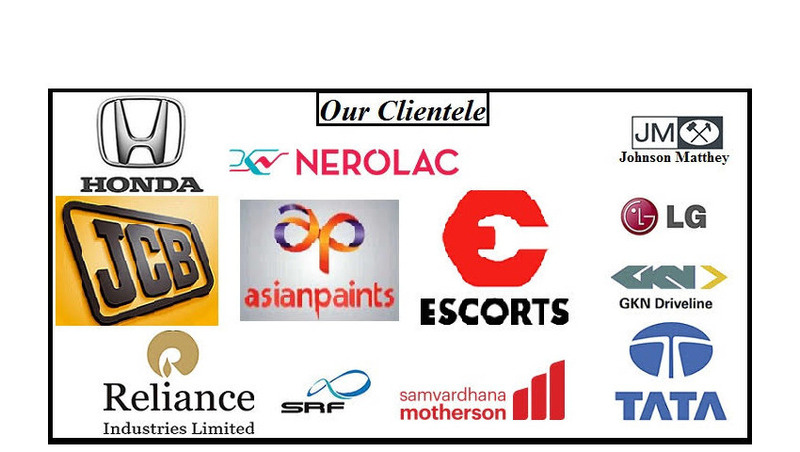 We are a Reputed Distributors, Suppliers, Retailer of Karam Safety harness & other Body harnesses from Delhi India. Karam Safety harness is a form of protective equipment premeditated to protect a person from injury or damage. These have front D-ring, side d-rings and are widely used for accidental or planned fall protection. We are offering different Karam Safety harness like half body safety belt, full body/fall protection safety belt, shock absorbing webbing lanyards and much more. The Karam Safety harness distributes fall forces throughout the body and thus reduces the chance of injury. These Safety Harness are widely used in various construction & industrial units & Karam Safety Harness is the leading one. We are dealing Karam Safety harness in Delhi (NCR), all cities of Uttar Pradesh like Ghaziabad, Noida, Greater Noida, Gautam Budh Nagar, Meerut, Moradabad, Bareilly, Aligarh, Agra, Bulandshahar, Kanpur, Lucknow, Unnao, Banaras / Varanasi, Allahabad, Lucknow, Gorakhpur, cities of Haryana, Faridabad, Bahadurgarh, Gurgaon, Ambala, Sonipat, Panipat, Cities of Uttrakhand / Uttranchal like Dehradun, Roorkee, Haridwar, Rudrapur, Ramnagar, Haldwani, Nainital, Mussorie, Cities of Bihar like, Patna, Darbhanga, Bhagalpur, Begusarai, Motihari, Siwan, Gaya, Mokama, Jamalpur, Purina, cities of Jharkhand like, Ranchi, Ramgarh, Jamshedpur / TATA Nagar, Dhanbad, Bokaro, Deoghar, Medininagar, Phusro, Dumkar, Hazaribagh, Gumla, Gomia, Cities of Rajasthan like, Jaipur, Alwar, Bhiwadi, Neemrana, Udaipur, Jaisalmer, Cities of Punjab like, Chandigarh, Ludhiana, Amritsar, Ambala, Cities of Madhya Pradesh like, Gwalior, Indore, Bhopal, Etc. 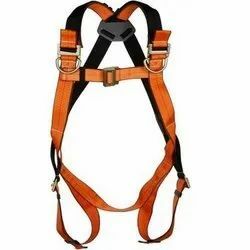 We offer these Karam Full Body Safety Harness PN-43 for fulfilling the requirement of security equipments and are available in various specifications that meet international quality standards. We manufacture these CE Marked Harnesses using extreme quality raw material that is procured from our reliable and trusted vendors. 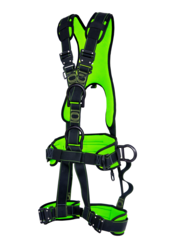 FULL BODY ADJUSTABLE WORK POSITIONING SIT HARNESS WITH PADDED LEG STRAP & SHOULDER STRAP, ONE VENTRAL D-RING, ONE STERNAL D-RING, ONE DORSAL ATTACHMENT D-RING, TWO LATERAL D-RINGS ON THE SIDE. Karam Safety Harness Magna - 3 with 1 Dorsal & 1 Sternal D-Ring for fall arrest. 1 Ventral D-Ring waist level in front for rope access & 2 Lateral D-Rings at waist level on the sides for work positioning, 2 mtr. Polyamide Lanyard & Hook PN 121 As Per EN 361:2002 & 358:200. We offer an exotic range of Karam Safety Harness PN-21 which is manufactured using premium quality of raw material which is of excellent tensile strength. These are used for security vigilance against any crime activity and are available in various specifications and features. 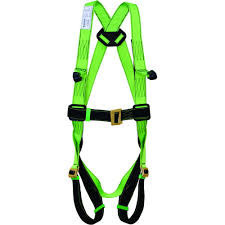 This Karam CE Marked Harness is renowned for high durability and tensile strength. We do high quality packaging of this CE Marked Harness as to supply these in various parts of the country. Shoulder And Thigh-straps Differentiated By A Dual Colour Scheme. A single Dorsal Attachment D-Ring for Fall Arrest. We fulfill the requirement of Karam Safety Harness PN-56 that is used in various security organizations for fighting against any uninvited violence such as terror activity.These Tower Harnesses are widely demanded for salient attributes like complete body tightness, easy to wear, extreme flexibility and durability. We do complete quality and performance measure inspection of these Tower Harnesses before supplying these to our esteemed clients. An Ideal Combination Of Fall Arrest, Work Positioning, Rescue And Rope Access Applications. Soft Padding On Shoulder, Waist And Leg Straps For An Extended Comfort. Also Available With an Extension Band-Ref- PN 56 (E). One Dorsal and One Chest D-Ring for Fall Arrest. One D-Ring at waist level for rope access work. Two Lateral D-Rings for Work Positioning. 2 Chest attachment textile loops and a Dorsal Attachment D-Ring for Fall Arrest. We offer an exotic range of Karam Safety Harness PN-43 which is manufactured using premium quality of raw material which is of excellent tensile strength. These are used for security vigilance against any crime activity and are available in various specifications and features. This Karam CE Marked Harness is renowned for high durability and tensile strength. We do high quality packaging of this CE Marked Harness as to supply these in various parts of the country. We offer an exotic range of Karam Safety Harness PN-16 which is manufactured using premium quality of raw material which is of excellent tensile strength. These are used for security vigilance against any crime activity and are available in various specifications and features. This Karam CE Marked Harness is renowned for high durability and tensile strength. We do high quality packaging of this CE Marked Harness as to supply these in various parts of the country. We offer an exotic range of Karam Safety Harness PN-18 which is manufactured using premium quality of raw material which is of excellent tensile strength. These are used for security vigilance against any crime activity and are available in various specifications and features. This Karam CE Marked Harness is renowned for high durability and tensile strength. We do high quality packaging of this CE Marked Harness as to supply these in various parts of the country. We offer an exotic range of Karam Safety Harness PN-22 which is manufactured using premium quality of raw material which is of excellent tensile strength. These are used for security vigilance against any crime activity and are available in various specifications and features. This Karam CE Marked Harness is renowned for high durability and tensile strength. We do high quality packaging of this CE Marked Harness as to supply these in various parts of the country. We offer an exotic range of Karam Safety Harness PN-42 which is manufactured using premium quality of raw material which is of excellent tensile strength. These are used for security vigilance against any crime activity and are available in various specifications and features. This Karam CE Marked Harness is renowned for high durability and tensile strength. We do high quality packaging of this CE Marked Harness as to supply these in various parts of the country. We offer an exotic range of Karam Safety Harness PN-351 which is manufactured using premium quality of raw material which is of excellent tensile strength. These are used for security vigilance against any crime activity and are available in various specifications and features. This Karam CE Marked Harness is renowned for high durability and tensile strength. We do high quality packaging of this CE Marked Harness as to supply these in various parts of the country. We offer an exotic range of Karam Fall Arrestor Block PCGS - 15 which is manufactured using premium quality of raw material which is of excellent tensile strength. These are used for security vigilance against any crime activity and are available in various specifications and features. 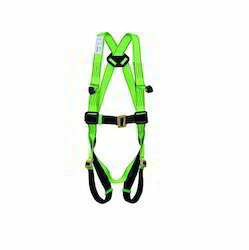 This Karam CE Marked Harness is renowned for high durability and tensile strength. We do high quality packaging of this CE Marked Fall Arrestor Block as to supply these in various parts of the country. We are the best supplier of Industrial Safety Belts.